Another Andro Linklater book, Measuring America, certainly worth the read especially if you’ve not read John C. Weaver’s The Great Land Rush. Not only some history of America’s Public Land Survey System and how it facilitated prosperity (at least for a while), but also some discussion of how the new nation almost adopted the metric system. But, as with Owning the Earth, Linklater commits a big error which makes me wonder how sound the rest of the book is. No! 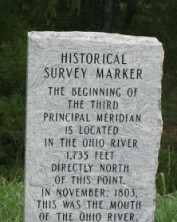 Not the Second Principal Meridian, and even if it was, there would have to be an “east” or “west” specified (as there should be a “north” after the “39.”) This is not an obscure fact and is referenced commercially as well as by surveyors, assessors, real estate attorneys etc. As this is wrong, how much else in the book might be incorrect?